OC Prudent Bear: How Much Is It Worth? I've been scratching my head a lot lately wondering how to estimate a fair market price on properties for sale here in Huntington Beach. 1,100 cramped square feet for $629,000 or $554/sqft where other properties in the area are selling for under $400/sqft. No wonder the house had been on the market for almost half a year. Comprables properties are of some value, but are problematic because with property prices plummeting as they are, any property sold more than 30 to 60 days prior is no longer reflective of current values. So, if asking prices are meaningless and comprables are of rapidly diminishing value and subject to the influence of knife-catching, sixes-splitting idiots, how can one value a home? I'm not certain but I think I've found something that can help. I was visiting one of my favorite blogs papermoney.com last night and found a remarkable home pricing tool. It's a home price calculator that uses the past sales price of a house to estimate its current market value. The way it does this, is by comparing the Case Shiller Home Price Index at the time of last purchase and extrapolating the current price and future price of the home by the looking at the current trading price and futures price for the index, respectively. Being a quant and a big fan of Case Shiller, I think this tool is pretty damn cool. It's really easy to use. Select the region your suspect home is in; in our case it is the CS Los Angeles market, type in the last sale date of the property you're interested in buying and the amount at which it sold--that's it. The tool will then calculate its past, current and future value (3 and 6 months out) for the home. Let's do an example together. Here's a house I had a passing interest in over the last few weeks. 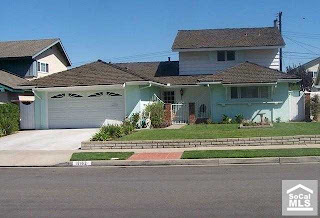 It's a nice house on a cul de sac, almost 2,400 sqft, very serviceable with a price reduced down to $625,000. Even for this market it almost seems like a good deal at $264 a sqft. But is it really? So we type these values into the calculator and what do we find but that, at least according to this calculator, this price is still roughly $60,000 over market. I showed this to Mrs. HB Bear and we agreed that we'd pass on this fine little number on Autumn Circle. So, fellow ursines, when you're considered making an offer at a home in the future, be sure to check out this fine little tool first. (I've added a link to the Cool Tools section of the blog for your convenience.) It may not be an exact estimate of the value of a home, but IMHO it is far more accurate than unrealistic asking prices and short expiry comps and just might prevent you from making a big, big mistake. Only problem I see is it undershoots in nice areas and overshoots in hard hit areas. Where I live in DC, we have burbs down 50% from peak. Others are only 5% off peak and selling better than they were last year. Thus, if I type in a past sale in a nice area, it gives me a current value way too low, and in a crappy area, a value way too high. I disagree a bit on the six spitting idiots. Sales where I am looking are now up 10% year over year. 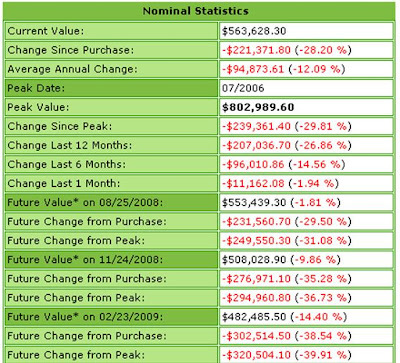 Inventory is way down - less than same point in 2007, 2006 AND 2005! OK maybe they are idiots but they make up the market and I have to compete with them. DC is not CA so you dont need to worry about this - yet. Just be careful - This time last year I thought I was ready to get a sweet deal and cratering prices. Now with sales up and so little inventory left to choose from, I think I may be screwed! Yeah, home sellers have a tendency to overprice their properties because it's hard for them not to be subjective, not to mention the fact that they are probably facing a lot of debt, and want the house to be able to pay for them.